You probably noticed one of Ugo’s passions in his picture. See those paintings next to him? They are his. He is a self-taught artist and his work in pencil and oils is amazing. His lighthouse looks as if you are staring out a window- it’s that good. His other passion is a little complicated. He became the “Mayor of Reddington Beach” because when his wife of 65 years passed, fishing was his only comfort. That’s his other passion. Fishing. I promise- you meet this man and you feel like you are better for it. You know exactly what I’m talking about don’t you? Because you were drawn to the Palm Garden Family for exactly that reason. You know underneath all the sickness, all of the age- there’s a human being with a rich tapestry of life. You know a hundred people like Ugo- each different and special. And it’s our guests and residents that get us up in the morning. This beautiful, tender man and his loving daughters had nearly lost hope. They really didn’t want to give another rehabilitation center a try based on a bad experience with another post-acute care center. And yet there he is- all smiles. His daughters explained to me that even THEY were apprehensive about trying another rehabilitation center. And when Ugo was discharged late on a Friday night again they were pretty sure another negative experience awaited them. But even after 7:00 PM on a Friday, Mr. Nanni and his daughters were welcomed- “we’ve been expecting you Mr. Nanni, these must be your daughters.” Our team members at Palm Garden of Largo at every level have worked together from start to finish to make sure this treasure of a man has a great experience. 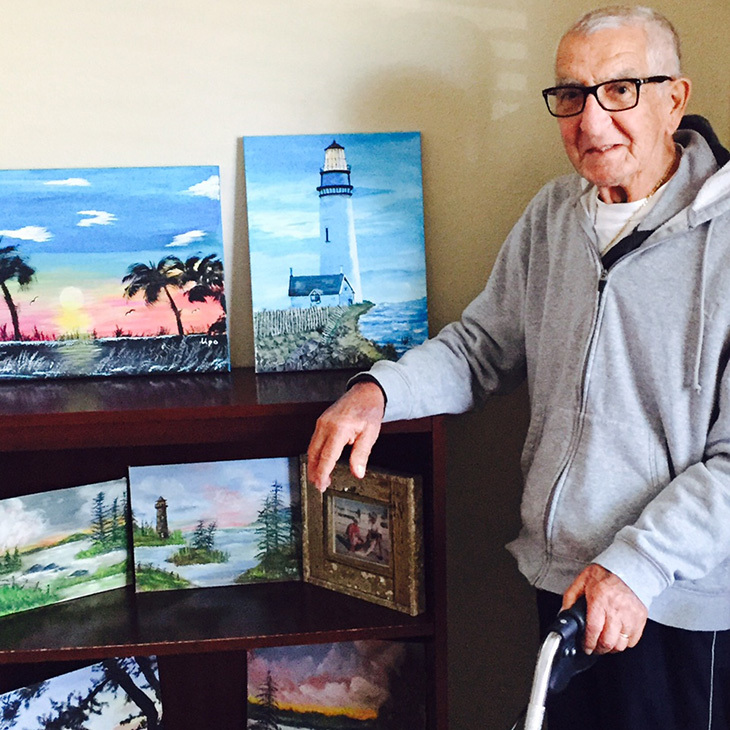 His room is now adorned with his amazing paintings. Clinical excellence combined with service excellence make us a world class organization. Every guest, every resident, every time. This is who we are. This is what we do. This is how we are making healthcare great again The Palm Garden Way.